LET THE SUN SHINE IN! STEP INTO THIS BEAUTIFUL CONTEMPORARY HOME WITH 9' CEILINGS AND WINDOWS THAT FEATURE ABUNDANT SUN LIGHT. GORGEOUS KITCHEN FEATURES FANTASY BROWN GRANITE, WHITE SHAKER STYLE CABINETS WITH SOFT CLOSE FEATURE, NEW STAINLESS STEEL APPLIANCES. DOWNSTAIRS MASTER BEDROOM WITH 2 LARGE CLOSETS, DOUBLE BOWL VANITY & ADDITIONAL DRY VANITY. UPSTAIRS FEATURES 3 SPACIOUS BEDROOMS AND LARGE BATHROOM. GAS FIREPLACE IN LIVING ROOM FOR COZY WINTER NIGHTS. BEAUTIFUL OPEN FLOOR PLAN ON LARGE CORNER LOT IN QUIET NEIGHBORHOOD THAT FEATURES A POND AND PLAYGROUNDS. QUICK ACCESS TO EITHER DOMINION BLVD OR I-64. AMAZING GRASSFIELD SCHOOLS. 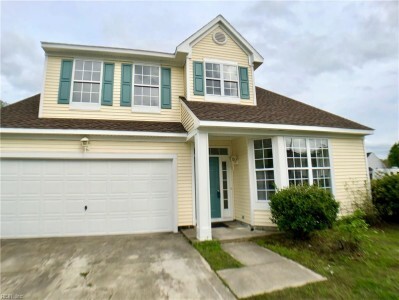 Send me more information about the listing at 2101 Sunset Maple, Chesapeake, VA 23323, MLS# 10252648. This 4 bedroom, 3 bathroom home located at 2101 Sunset Maple, Chesapeake, VA 23323 has approximately 1,890 square feet. It is currently listed for 315000.00 and has a price per sqft of $16,667. This home is currently Active under the MLS#: 10252648. It is listed by Prodigy Realty. 2101 Sunset Maple, Chesapeake was built in 1998. It has Garage Att 2 Car, Driveway Spc parking. The kitchen includes Dishwasher, Dryer Hookup, Microwave, Elec Range, Washer Hookup. 2101 Sunset Maple is part of the Deer Crossing neighborhood located in 23323.